My apologies for this blog post to Sir William Schwenck Gilbert, who collaborated with Sir Arthur Sullivan on a series of comic operas that included The Pirates of Penzance. Pirates premiered in 1879 and featured a song called “I am the Very Model of a Modern Major-General,” and I am far from the first to put forward a parody of this tune. Gilbert not only wrote the librettos but also provided illustrations, under the name “Bab,” for the published versions of the operas. 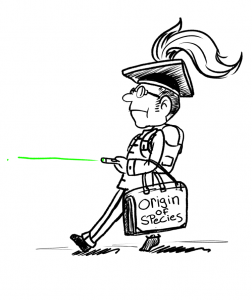 Our frameshifts cartoonist, Retrosleep, who also goes by the name Tom Palumbo, does his own parody here of Gilbert’s drawing of the major-general. And Vijay Ramani, a grad student in Genome Sciences at the University of Washington, offers a rendition of the tune, accompanied by Ian Blumenthal, a grad student in Bioengineering at the University of Washington. My thanks to Jane Gitschier and Jane Fields for making this version singable. And mating with Neanderthals that led to introgre-es-sion. They equalize transcription via dosage compensa-ation. I am the very model of a classical geneticist. I publish in Genetics or another one-word magazine. Because in ev’ry arcane matter I am professorial. Very cute but a true classical geneticist would not bother with the molecular part. We just enjoy designing infernally, fiendishly clever screens and building brilliant models by deduction. The song is really about model organism molecular geneticists and should perhaps be sung in close harmony Ina private audience with Francis Collins, in an effort to save the MOD databases from centralization.